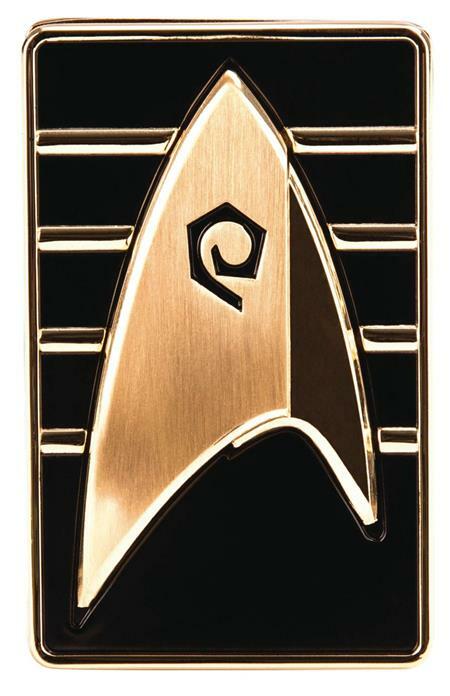 The Star Trek: Discovery Cadet Badge, as seen being worn by Cadet Sylvia Tilly, features a bronze delta with the stylized Operations spiral on a black rectangle. The four gold stripes on the badge's background indicate that Cadet Tilly is in her fourth year of training to be a Starfleet officer. As with all of QMx's Star Trek badges, the cadet badge is an exact replica of the screen-used hero prop. In making the replica, we started with the 3D files the Discovery prop department used to create the original, then referenced the actual hero prop from the show for size, detail and color. The result is a perfect simulation of the badge that has been approved by the show's propmaster. The Cadet Badge includes QMx's unique magnetic clasp, which uses strong, short-field magnets embedded in the badge and a separate backplate (included). No more pinholes in delicate fabric; they can even be worn on leather and suede.